Blind tasting is the best way to objectively taste wine. It is the way wine experts taste wines. Bagged Wine has created a product so that blind wine tasting can be conducted easily and elegantly. Blind is the only true way to taste wines. R. Michael Mondavi, Chairman and former CEO of The Robert Mondavi Corporation, in a recent quote, emphasize the importance of blind tasting; "Your mind overrides your palate and your sensory perceptions when you don't taste blind". 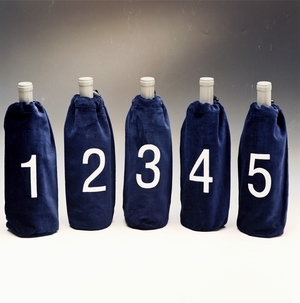 Bagged Wine has replaced the problematic blind tasting process of wrapping wine bottles in brown paper bags and taping the neck of the bottles, with a complete kit of high quality, numbered, velvet bags. Bagged Wine's products will become the standard for blind wine tasting.